Visit the published coordinates which is the village sign and answer a few questions to find the coordinates of the cache. Potton is a town and civil parish in Bedfordshire. Its population in 2011 was 7,789 people. 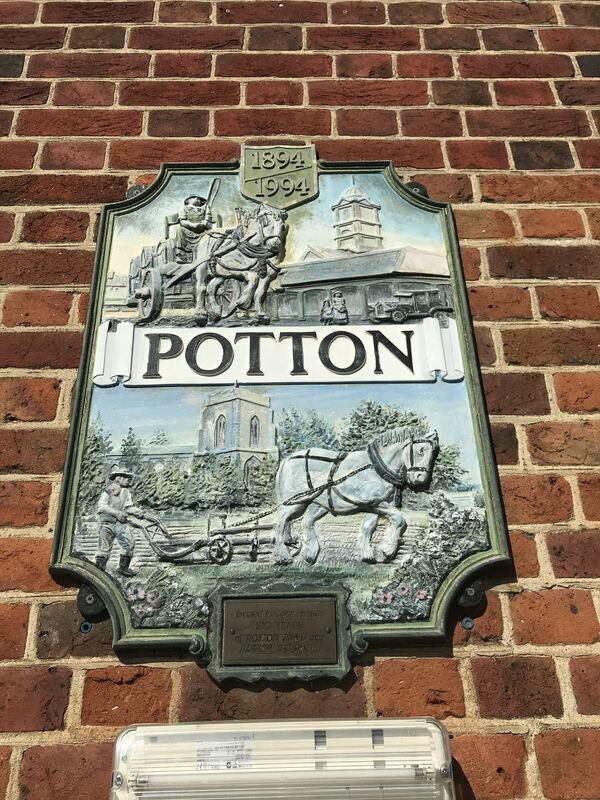 In 1783 the Great Fire of Potton destroyed a large part of the town. The parish church dates from the 13th century, and is dedicated to St Mary. Potton's horse fairs were some of the largest in the country. The village's name was spelled Pottun in 960 AD and Potone in the 1086 Domesday book. It is derived from the Old English for "farmstead where pots are made". The Great Fire of Potton started in a stack of clover in a field in the area of what is now Spencer Close, in 1783. King Street, half the Market Square and some of the Brook End area were destroyed. It was reported to have burned for a day. Local people raised £6,000 to help those most in need. Providing temporary accommodation in nearby fields for the townsfolk alone cost £25,000. The 13th-century parish church, St Mary's, survived. Rebuilding after the fire has left the town with a number of Georgian buildings. The village sign is attached to the wall. On the bottom of the village sign is a plaque. Take the number of words in the first line to be A. The number of letters in the first word of the third line is B. The number of years is C00. You will probably want to drive to the cache location (unless you're feeling energetic).